At the drupa 2012 exhibition in Düsseldorf, the online shop of onlineprinters.com supports the technological leader POLAR-Mohr as a cooperation partner in showcasing a new generation of high-speed cutters. During the international printing trade show from 3 to 16 May, the features of the new "high-speed cutter POLAR N PRO" will be presented by means of 80,000 printed sheets produced by the online print shop Onlineprinters GmbH while cutting flyers for a sweepstake. "The online print service provider Onlineprinters GmbH is so far our first customer to use the beta version of the new software POLAR Compucut® with real image representation", Jürgen Freier, POLAR Director of Sales and Service, explains. "Up to now, the single stacks are depicted on the high-speed cutters as areas of colour. With the new technology of real image representation, the arrangement of labels, business cards or flyers is now displayed on the printing sheet as a real image. The operator of the cutter thus gains an additional visual control over the entire cutting process of the printing sheet", Freier comments the technology leader's new and innovative high-speed cutter generation N. At the POLAR stand in exhibition hall 2, A01, the new cutting technology will be shown in daily live demonstrations. In the course of the drupa 2012, a total of 80,000 printed sheets will be cut into flyers that provide information on the sweepstake. 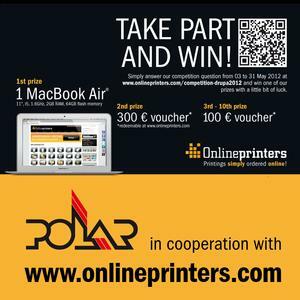 By using the QR code shown or visiting the micro site www.onlineprinters.com/... , trade fair visitors and customers of the online print shop can participate in the sweepstake from exhibition start on 3 May until 31 May 2012. The German e-commerce business Onlineprinters sells its offset and digital print materials through online shops all over Europe and is one of Europe's leading online print shops. Behind the German brand diedruckerei.de and the international brand Onlineprinters stands a conventional print shop where qualified specialists produce printed material using state-of-the-art printing machinery in PSO certified production facilities: "Quick and reliable handling of printing orders requires not only efficient production processes, but also state-of-the-art technology in printing and cutting. That is why we exclusively use state-of-the-art high-speed cutters by POLAR for cutting our printed sheets", says Armin Wondrak, plant manager of Onlineprinters GmbH. With its quality policy all around certifications, security in online shopping, transparent pricing without any hidden costs and short delivery times, the online shop www.onlineprinters.com is a reliable print partner for advertisers. Question of the drupa 2012 sweepstake: What is the name of the new generation of POLAR high-speed cutters that is presented at the drupa 2012 for the first time?